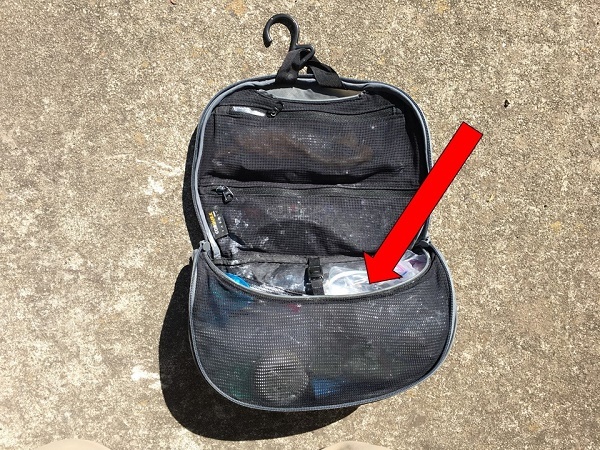 Most people don’t think of a toiletry kit as a source of bulk and weight. Yet the difference between a small and large kit can be as much as 1-2 pounds (0.5 – 1 kg)! A small kit is one half to one third the size of a larger kit. Reducing the toiletry kit can bring big savings in weight and bulk. The traveler should always look at the toiletry kit when trying to go lighter. 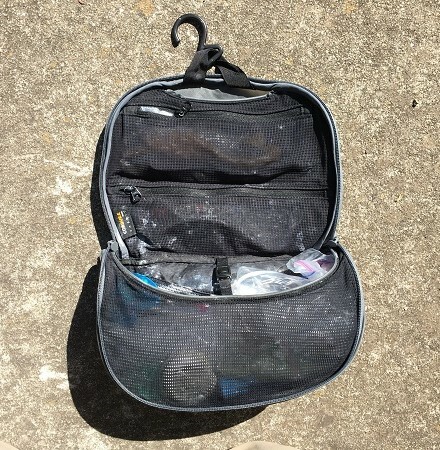 I use the small Sea to Summit Traveling Light Hanging Toiletry Bag for all of my travels. It weighs a mere 2.5 oz. (80 g). 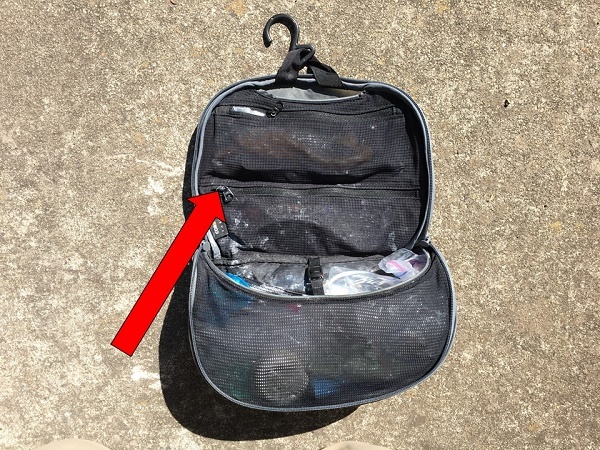 Many people avoid ultralight toiletry kits because they think that thick heavy material is stronger than light material. It isn’t always true! Strength depends on the type of thread, the weave, and the coating. The Sea to Summit Ultra-Sil material is strong, thin, and light weight. The toiletry kit also won’t get the same abrasion that your luggage would get. That means that you don’t need the heavier material. You really can save weight and bulk by buying a lighter toiletry kit. 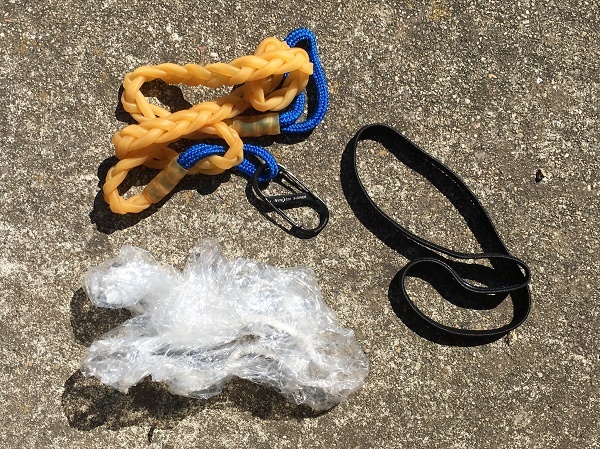 You can even make an ultralight kit from a zip top bag, a piece of gaffers tape, and a small carabiner. I slide the carabiner from my liquids bag over the hanger from my toiletry kit. The two bags hang together. 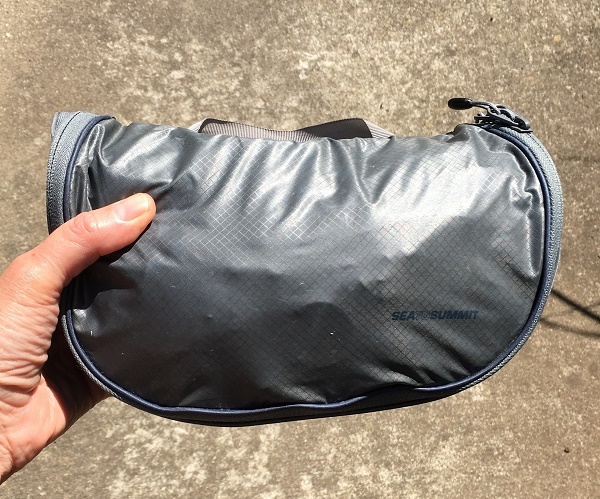 An inexpensive toiletry kit made from a zip lock, gaffers tape, and a carabiner. Today I’ll give you a tour of my toiletry bag and my liquids bag. 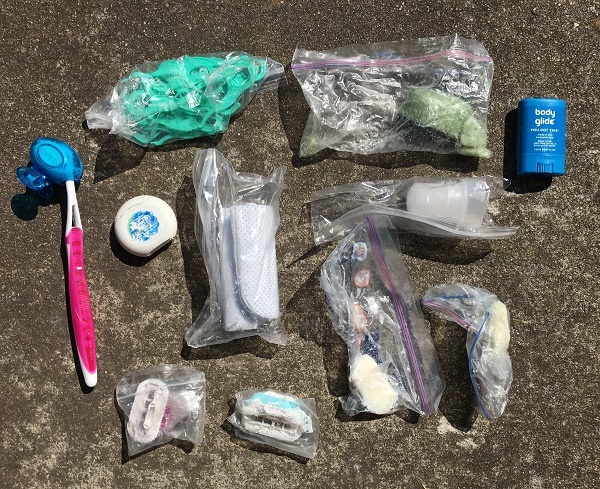 I’ll show you how I consolidate and downsize my toiletry things for personal item travel. 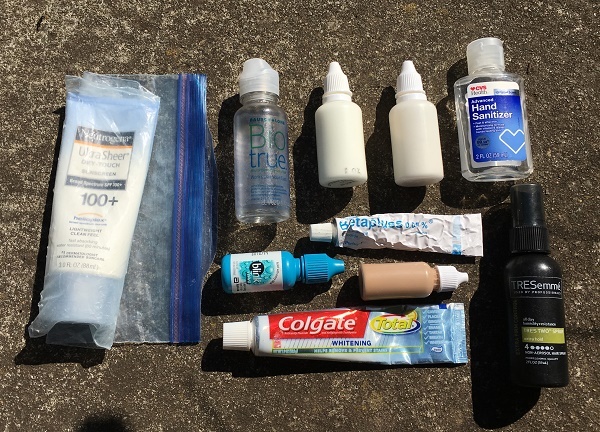 My toiletry kit is actually larger than the kits used by many ultralight travelers. That is because I also use the kit as my junk drawer. It is a place where I store all the little odds and ends that are useful on a trip. This was a choice I made early in my travels. I found that I was leaving important things behind in my hotel room. I decided to consolidate everything into a single kit so I only had to remember one bag when I was collecting bath items. I eliminate the bulk and weight of the packaging for each item that I consolidate into my kit. Everything in my toiletry kit lives there permanently. It is pre-packed so I never have to worry about transferring items back and forth. I refill my kit after every trip so it is ready to go for the next trip. The kit has 5 different pockets. Let’s take a tour of my toiletry items. 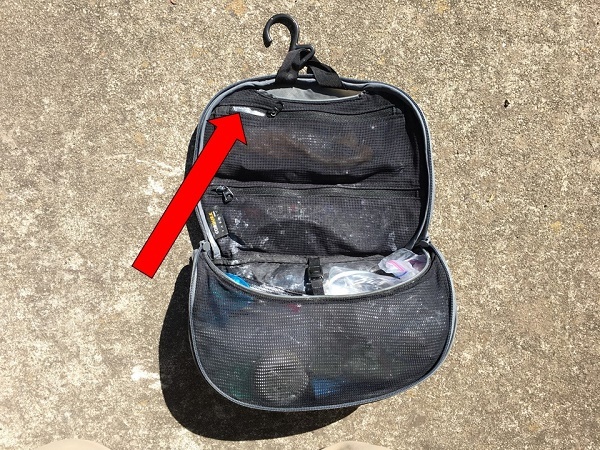 The back pocket of my toiletry kit is where I store my laundry items and my washcloth. I put the washcloth in the outside pocket so that it will dry out faster. 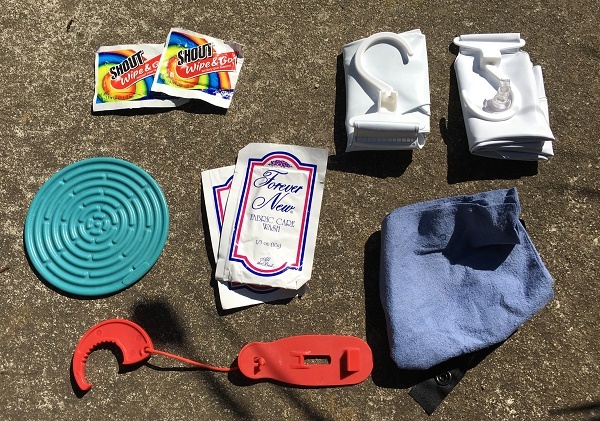 The pocket also holds Shout wipes, Forever New laundry packets, a sink stopper, two inflatable hangers, and a portable deadbolt. The Forever New packets are usually good for 2-3 sink washings. I can also use my soap to clean my clothes if needed. Note that I bring “just enough” for any trip. This saves bulk and weight. I have found that the inflatable hangers are great when you have room mates. It eliminates fights over who gets the hotel hangers. The upper pocket doesn’t have much in it. I have a hair band, a light weight shower cap, and my Flex-O-Line laundry line. Note that I’ve added an S-biner to the end of the laundry line so I can wrap it around objects. A laundry line isn’t necessary but I’ve found that stringing the line across the bath tub lets the laundry drip into a waterproof area. Once the laundry stops dripping I move it into the main room where it can get more air circulation. Note that the shower cap is ultra-light and not at all bulky. I have found that the ones offered by hotels are lighter and smaller than the ones I can find in the store. The middle pocket holds various small odds and ends. This is where I keep my sewing kit and my eyeglass repair kit. I put the two together into a small plastic bag. I also store my hair accessories here – basically a large barrette and a few hair pins for when I want to put my hair up. 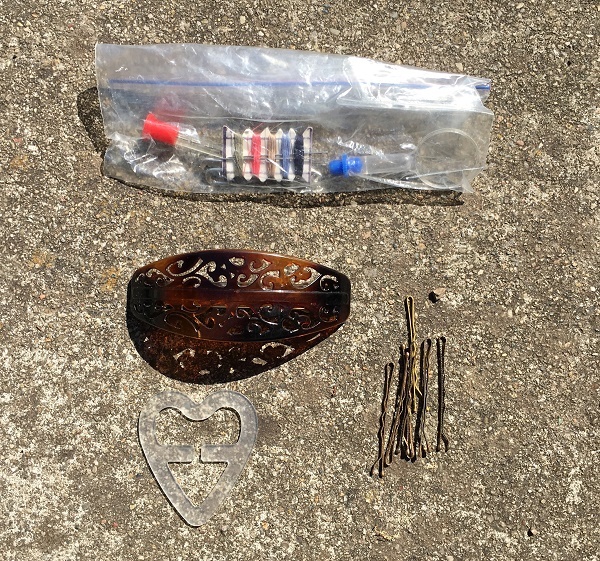 The clear heart shaped piece of plastic is a bra converter. 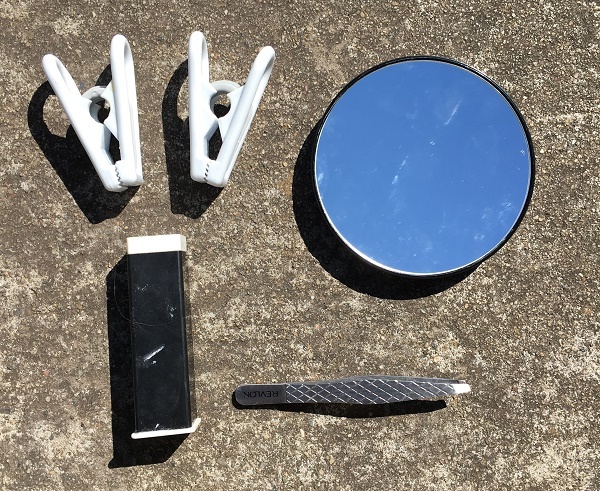 The very back pocket of my toiletry kit holds my magnifying mirror – critical for when I put in my contacts. It also holds a pair of tweezers, Janie spot remover, and a couple of clips. The clips turn regular hangers in to pants hangers. They are also great for pinning curtains shut. I could probably downsize these clips and just use bread bag clips. 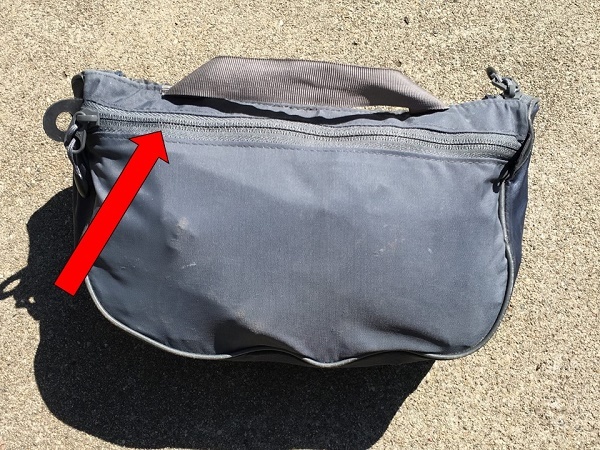 The main pocket of my toiletry bag holds the items that I use most. It has my toothbrush and cover. Note that the cover only goes over the head of the brush. This saves bulk and weight. The pocket also has my dental floss and flossing sticks (transferred into a plastic bag to save on bulk). It has my soap and solid shampoo. Each of these has been cut down and placed into a small plastic bag to save weight. I cut my Olay facial wipes into quarters and place those in a plastic bag. You will also see my travel size razor and two spare heads. I have a small stick of body glide for when I wear dresses. I also have a small travel sized deodorant crystal. I took the crystal out of its original packaging to save bulk and weight. On longer trips I will add in toothpaste dots. On shorter trips (under 3 weeks) I just bring regular toothpaste. The green stuff is Lush solid conditioner. My liquids bag contains a full sized (3 oz, 100 ml) tube of high SPF sun screen. I’m very fair and have battled melanoma in the past. I now use sun protective clothing, but still need lots of sun screen for my hands, legs, and neck. I bring high SPF cream just to make sure I have it when I need it. The liquids bag also has a separate 1 oz (30 ml) dropper bottle of high SPF face sun screen with moisturizer. I brought a 1 oz (30 ml) bottle of moisturizer for evenings. I would have been fine with just a 15 ml bottle. I ordered the dropper bottles from Amazon and used a syringe to decant the face cream. The dropper bottles are much smaller and lighter than the Nalgene bottles that you find at camping stores. You can find multiple sizes of dropper bottles from 5 ml up to 100 ml. I included a 15 ml bottle of CC cream foundation for my trip. I put the cream in a contact lens case for shorter trips. If you look at the picture you’ll also see that I have travel size eye drops, lens solution, hair spray, hydrocortisone cream, hand sanitizer, and toothpaste. I normally don’t take hand sanitizer. I brought it on the last trip because we spent significant time in the back country away from toilets. That’s everything in my toiletry kit! I store my medications and nail clippers in my travel comfort kit. I find that I’m likely to need my medicine most when I’m in transit. That’s a subject is for another post. All of that packaging adds bulk and weight to my kit. I removed all of those items when I decided I needed to go lighter. I usually don’t miss it. Decant your items so that they are as small as possible. Do this for both liquids and solids. Order smaller dropper bottles and fill them with just enough liquids for your trip. Do this ahead of time. If you wait until the last minute you probably will take the larger item. Weigh your kit. Can you reduce the weight? 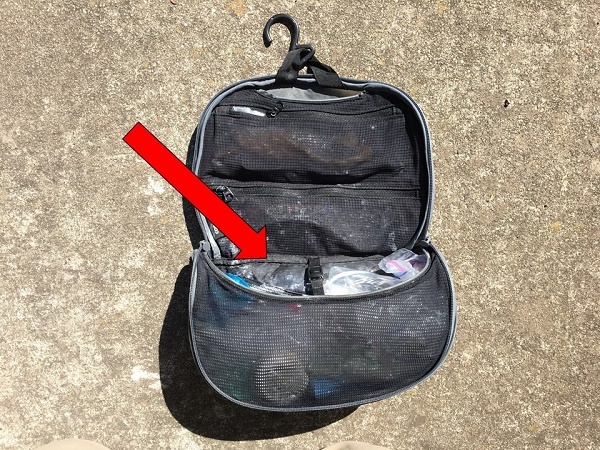 Can you reduce the size and weight of your toiletry bag by replacing it with something smaller and lighter? Can you replace the original packaging from any of the kit items for something lighter, like a pocket or a zip top bag? 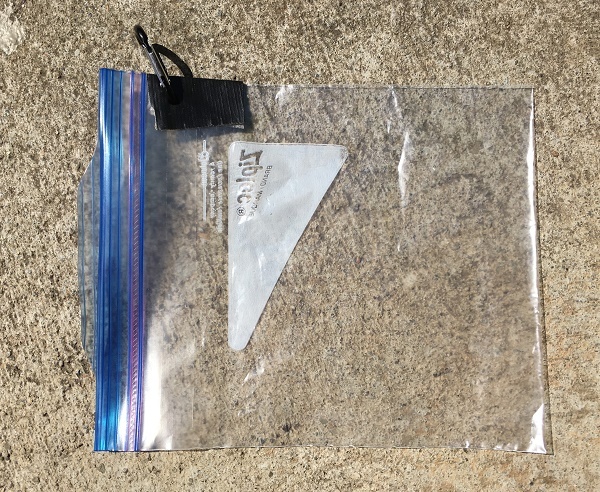 Can you consolidate small items into a single pocket or plastic bag? Can you decant/depot any item into a smaller size? Great article: very informative; thank you. I have a question: I see you travel with nail clippers and tweezers. Do those not get confiscated at customs? Or is it only scissors that get the snip? It’s highly dependent on the country and the security procedures. So far I’ve been find, although I almost lost the tweezers in Nairobi. Wonderful post. I have many of the same laundry and personal items but felt I was carrying too much. You’ve shown me some great ways to reduce bulk and weight. I decant my liquids but have trouble finding containers that are really squeezable. Do the dropper bottles past that test? Any recommendations about where to get them? I’m happy with the dropper bottles. I ordered them from Amazon. They come in bulk shipments but I can give the rest to friends. 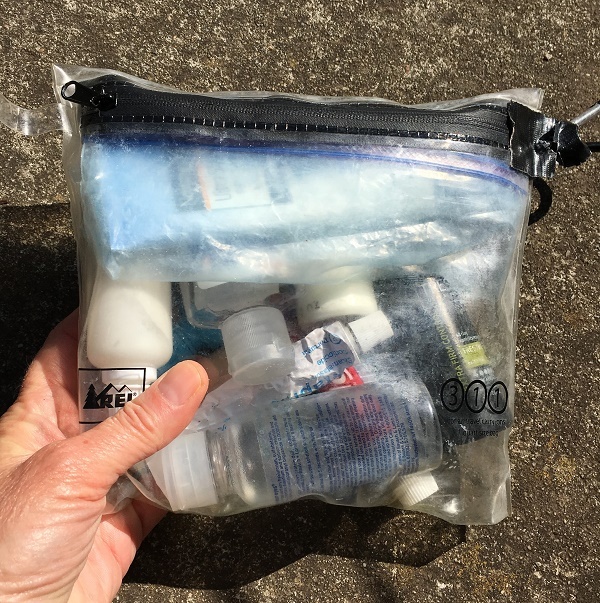 Really timely post — I have reduced my packing pretty well, but my (really large and heavy) toiletry kit is often my Achilles’ heel. 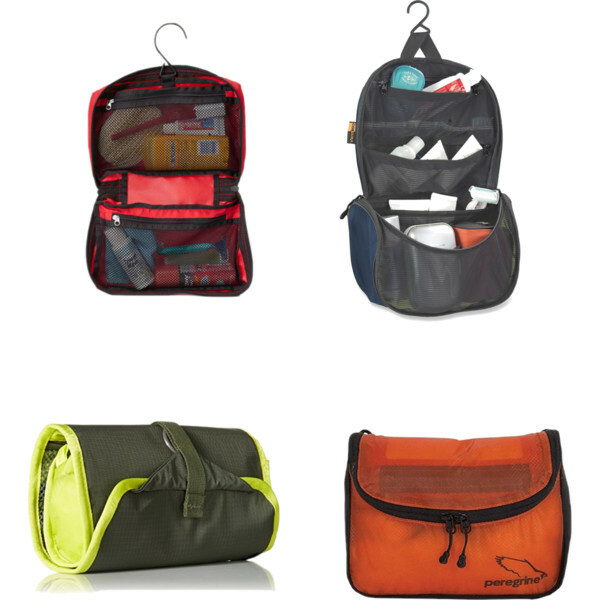 I will check out the suggested bags as I prepare for some one-bag flights on European discount carriers later this year. I didn’t think I needed to replace my toiletry kit, but did it anyway to save weight. The smaller kit forced me into taking the steps needed to go lighter. I was forced into decanting, forced into replacing containers with plastic bags, and forced into consolidating items into pockets. I was stunned at the difference after I made the change. Inspirational! Love the detail and pictures.. Loved this article.When we did a 10 week trip a couple of years ago, I even measured how much QV bath oil(great for post M/P women for sensitive areas! ),special shower wash only available in Australia,shampoo&conditioner I would use for the whole trip and just packed that much.I never ran out!! Thanks so much for the tiny bottle suggestions (links)-I also keep small empty glasses cleaner spray bottles and fill them with anything that needs/can be sprayed. Lots of containers can be recycled for travelling. 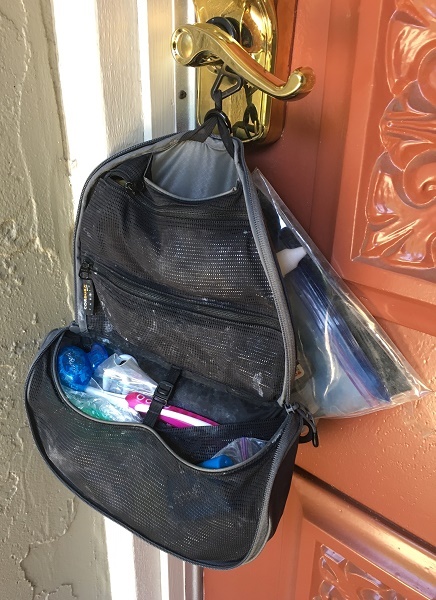 I saw someone recently who used an evening purse as their toiletry bag! It was a soft, black clutch that had a carabiner attached for hanging. Eddie Bauer makes thin soap sheets. Might be useful in a day pack. I bought them but have not tried them yet. The largest item in my entire toiletry kit is the hard-case for protecting my eyeglasses. I have yet to figure out a way to reduce that weight and bulk but still protect the glasses! I use a hard sided glasses case. I keep it in my travel comfort kit or in my purse. It doesn’t reduce the weight but it does get rid of the bulk while it is in storage.